In collaboration with Axiom, West Lindsey District Council and the Homes and Communities Agency this project saw Woodhead Living transform a former industrial site into 12 BREEAM Very Good one-bedroomed apartments with additional communal training facilities. The regeneration of the site consisted of traditional masonry construction, single ply roofing membrane & UPVC windows installation, and zinc & render elements to the front of the building. The external works entailed building a car parking, soft landscapes areas and cycle storage. The Foyer, designed by Allan Joyce Architects, was delivered by Woodhead to a BREEAM ‘very good’ standard, and now provides supported accommodation for young people aged 16 to 25 years old. With over 120 Foyers operating in urban and rural communities throughout the UK, the Foyer Network provides safe, quality assured environments where experts reconnect around 10,000 young people every year with personal development opportunities, and back into education, training and employment. Ground Conditions & Flood Risks – Piled foundations were used to overcome unsatisfactory ground conditions and flood risk prevention methods were incorporated, due to the location of the build being in a high flood risk area. These included grading of the ground within the void under the ground floor beam & block floor; ensuring all electrical sockets, on the ground floor, were a minimum of 900mm high off the finished floor. Excavation Works – Initial records indicated that a Severn Trent Water sewer ran through the site, therefore careful exploratory excavations were required in the known area – from these exploratory works it was discovered that the sewer did not actually run through the site. A two week extension was granted to enable the excavation works to take place. 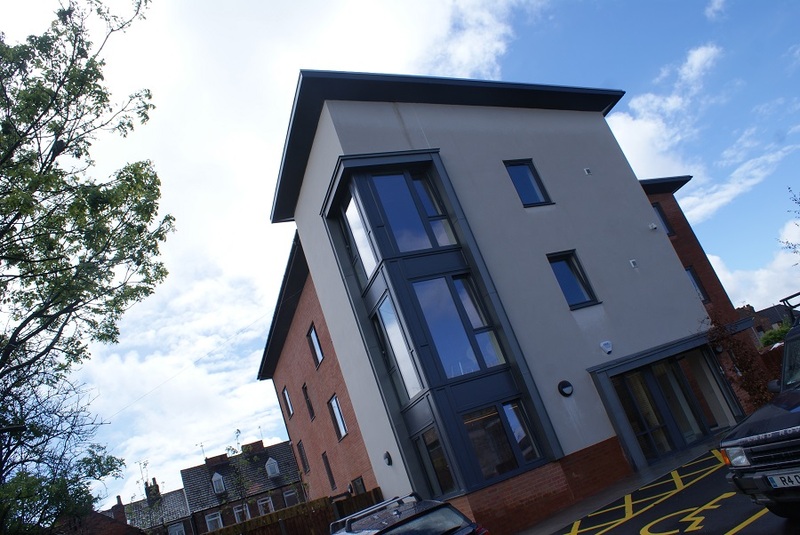 Live Offices – The land which the foyer was being built on was previously owned by the neighbouring Housing Association (Acis Group) and the compound was located within their yard area, meaning consideration was required for their needs throughout the build process. Delivered on time, and under budget. “We’re very proud to open this new foyer, which will enable 12 young people to have stability in their lives while gaining new skills and confidence to live independently.